Everyone knows that it takes money to do ministry. 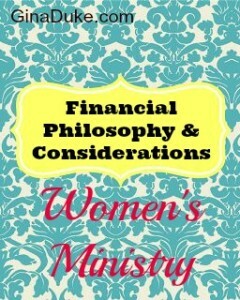 Depending on what you do with your women’s ministry, it may or may not require financial support. Although your pastor or staff will more than likely determine how to financially support the women’s ministry, if at all, it is still good to have a philosophy about the finances of the women’s ministry. Over time issues and challenges will present themselves, and you will want to have God-inspired philosophy to help you make the decision about how to handle them. My pastor is not a fan of fundraising. He believes that when people give as they should (tithing/meeting budget), the money will be there for ministry. Our women’s ministry is part of the church budget, which means that as tithes and offerings are collected, a portion of it goes toward women’s ministry just as the other collections support staff salaries, benevolence funds, office supplies, children’s ministry and the like. We have been blessed with generous givers at our church. The only organization that does do fund-raising is our missions support group, Women on Mission (WOM). They have historically raised a great amount of money to support missions, which my pastor has continued to allow. 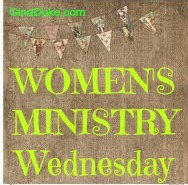 In 2012, the WOM came under the umbrella of Women’s Ministry, where they had previously operated separately. If you do intend to be self-supporting, you will want to determine the best place to raise your funds. Our WOM has limited their fundraising campaigns to 3 main events per year: a festival, a yard sale, and craft sale. Our community hosts an annual strawberry festival every spring. In the spring, our WOM puts up a tent on our church’s front lawn, which is on a main street of the event. We sale baked goods, crafts, balloons, and face-painting. During the summer, we take up item donations from our church members to set up in a large community yard sale. Our last event of the year is the craft sale. 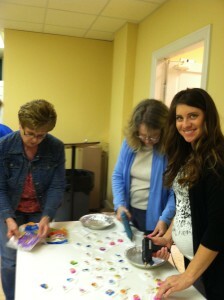 This is where our ladies spend the majority of their time in preparing crafts for this event. We don’t do a bunch of small fundraisers, but concentrate on three large events, where there is already a large draw, free advertising and facilities/logistics. We just show up with our wares and sale, sale, sale. I recommend that you think strategically and let the Lord lead you. Our WOM has raised a lot of money to support mission trips and missionaries through fundraising. It can be done well, with integrity and with ministry. When it comes to main events whether they be a retreat, conference or get-away, you or your pastor/staff will determine who will underwrite it. Some churches bear the full burden of the cost from the budget. As for my church, we like a conference to pay for itself without touching our budget. We take the cost of the speaker’s fee and lunch caterer, divide it by 300, and round the number up to a nice even number to cover other incidentals. We use the number 300 because based upon our past history we know that that is the minimum number of women whom will attend our conferences. Speaker’s fees range based upon how well-known the speaker is. I hear of more churches passing on expensive speakers for more local speakers, and even utilizing in-house Bible teachers as well. Prayer will help you, your team and/or staff determine what is best for your church and event. After dividing the speaker’s fee by the minimum number we expect, we will add $5.00 to the ticket price in order to cover the price of lunch. Our Saturday conferences typically lasts until about 2:00 p.m., but you could adjourn at noon and not forgo the cost of lunch. With this scenario, we may simply round up to $20 for the ticket price to cover the cost of a speaker, lunch and other incidentals. Should the speaker be coming to us from another state, where air travel and hotel arrangements are required for two (which is typical), we may round the $18.33 up to $25.00 per ticket to cover those additional costs. We have a local retreat center that we like to stay at for retreats. It is just outside our county, which makes it easy for mama’s to get back home to if they are needed and convenient for late arrivers due to work schedules. The cost of a one night stay with 3 nice meals is $69.00 at this facility. This is the cost we pass on to our women, while we then pay for the speaker’s fee from the women’s ministry budget. At this venue, we may use a more local speaker, which is more affordable. 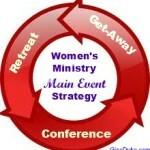 For a getaway, where we are traveling to a nearby city for a hotel stay to hear a speaker at another church’s conference, for instance, we may pay the cost of hotel from the women’s ministry budget and allow the women to pay for their meals and the price of the event ticket. Overall, unless this is a home event, we want the ladies’ total out-of-pocket expense to be no more than $75, if possible, when going away from the church. Scholarships can be a blessing and ministry. I remember being in a single’s ministry at a mega church after my divorce, and going on a single’s retreat to the Smokey Mountains on scholarship. I could barely make ends meet at that season of my life, so I did not hesitate to sign up for a scholarship. My church was so generous. They really did a good job communicating that they did not want anyone to miss this weekend of ministry because of financial constraints. It was a great and memorable weekend. You may decide to have scholarships for some events, but not others, depending on the circumstances. We have some very generous ladies whom will not only pay for their ticket, but also give money to pay for another ticket. If there is no money in my budget to cover scholarships, I make a list of first come, first serve to pull from in the event someone makes a scholarship donation to our event. Keep in mind that just because your ministry has a budget, it does not mean that the money will be there to cover the costs of scholarships. All of that is determined by how well your congregation is tithing and meeting budget. When you fundraise and/or have your own ministry checkbook, you want to be transparent. 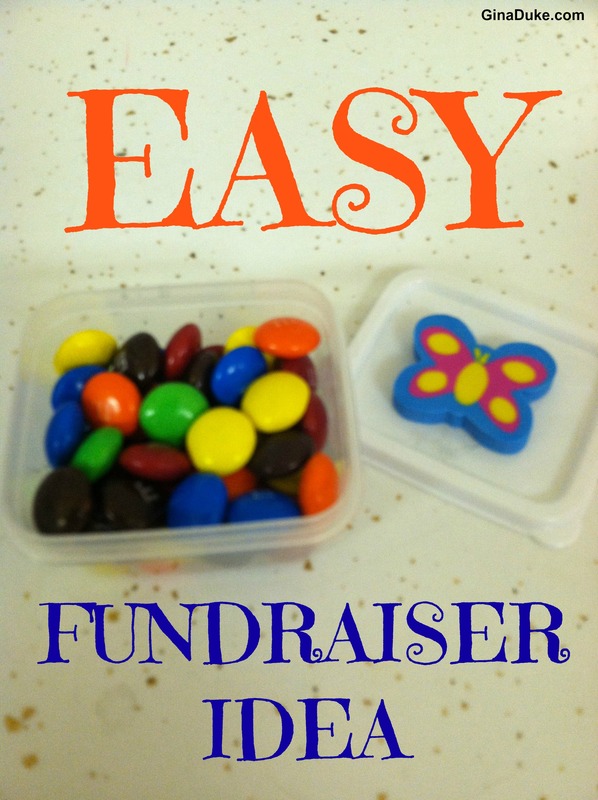 Make sure that you report out on how much was raised at fundraisers and how much was profit. Be able to show receipts and explain expenditures. Doing so is a demonstration of excellence. Plus, it protects your leaders/officers from any hint of mis-dealings or accusations of such. You may want to check with your church secretary, finance office or pastoral staff who can get more facts about this, but watch out when keeping a separate checkbook from the church budget IF you are using the church’s tax exemption number to make purchases. If you are, you should know that you are endangering your church’s tax exempt status. 1) Keep a separate checkbook, but pay taxes on purchases. 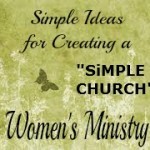 2) Place your ministry in the church budget where the secretary (or designee) will write the checks and keep record of our finances, but freely use their tax exempt number for purchases. Don’t worry; you can still fundraise for your women’s ministry if you desire and have designated donations for your women’s ministry line item. 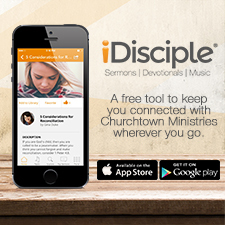 Again, you will want your pastoral staff to make the decision. My pastoral staff prefers that all of our ministries operate from our church budget. Remember, the reason we need funds for ministry is FOR MINISTRY. Don’t hoard the money! Take in the dollars with open hands, ready to release it for kingdom work! Here is a simple fundraiser idea: M&M Boxes! This is just one of the small change sales items we will sale at both our festival and craft fair. They make great stocking stuffers, but the way. 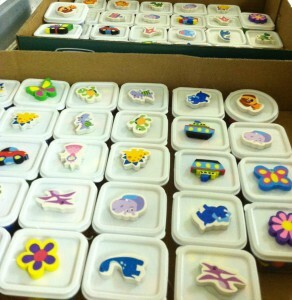 Simply, purchase mini plastic containers, M&M’s and decorative erasers. 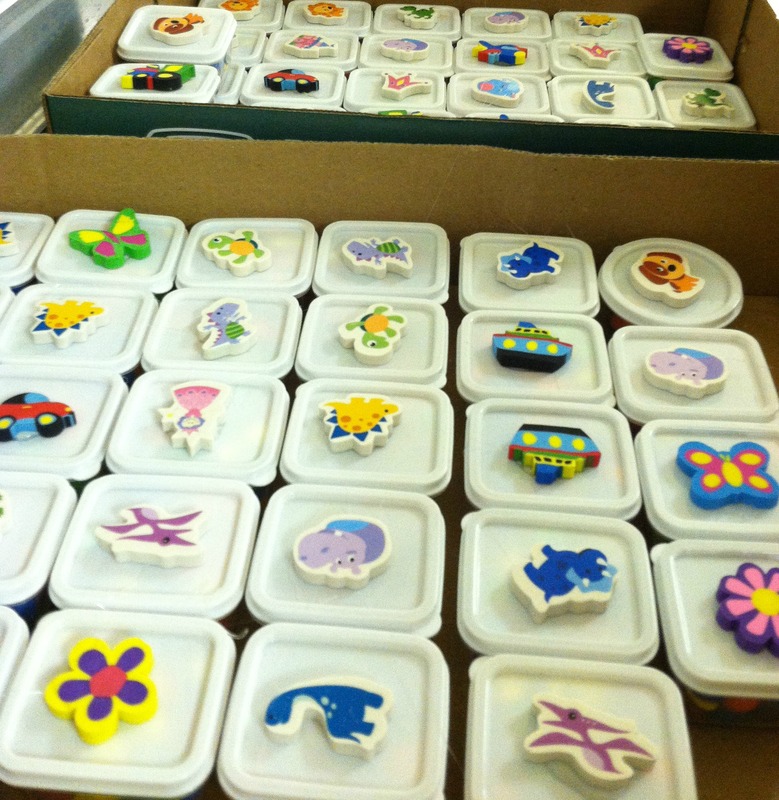 With a glue gun, hot glue the eraser on top of the container, and fill the container with M&M’s! We sell these things by the bushels! Click here, to see some other great bloggers that I like to link up with through the week. 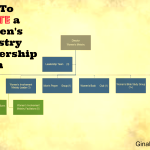 If this post was helpful to you, then why not share it?